You start in Oldenburg central station and take the Nordwestbahn (NWB) directly to Wilhelmshaven. From there it's just a few minutes to walk. From Oldenburg you take the A29 in direction to Wilhelmshaven. You leave the motorway at the exit Sande. Drive in direction to Wilhelmshaven (B210). After Sande you turn right to Mariensiel- WHV West. Follow these street. From there just follow the signs. The Wadden Sea National Park of Lower Saxony is the second largest national park in Germany. It belongs to the UNESCO world natural heritage. You will get to know an unique landscape!!! The National Park consists mostly of water and tidal flat and just a few of mainland. The coast and islands have especially great importance as a recreation center and natural experience space. A broad network of hiking, biking and riding trails enables to experience the national park intensively, without disturbing the nature. It is also possible to fly kites, because the strong wind on the North Sea coast invites you to do that. A specialty in this national park are the mudflat hiking tours. In a ships excursion you can get to know seals, fish and other aquatic inhabitants. Up to 4.000 animal and plant species are specialised in the unusally rich of food tideland habitat. At the same time the tideland is a resting area for breeding birds from Nordic countries. You can find 10-12 million wading birds, geese, ducks and gulls. Visit the fascinating German Marine Museum in Wilhelmshaven. It collects and preserves exhibits from the history of all German marines since 1848. Attachted to the museum is a 3000 square-foot outdoor area with moorings directly in the connection port. National Park Ship Borkumriff - is an information center and a museum ship today. Formerly it was a lightship. In guided tours old members of the crew deliver insights into the work on the ship with the beacon. Other interesting exhibitions are the Wadden Sea National Park and North Sea Protection. Offering free WiFi, a sauna and a large sun terrace, the 4-star City Hotel Valois is situated in the coastal town of Wilhelmshaven. The Wattenmeer National Park is 3 km away. 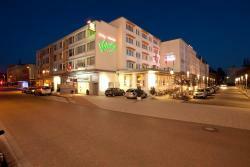 This 4-star hotel in Wilhelmshaven offers free Wi-Fi internet and free private parking. The bright rooms have a TV and private bathroom. The hotel is next to Brommy Park. The Residenz Hotel offers a bar which serves snacks and drinks in the evening. This 4-star superior hotel is situated in a beautiful location on the Jadebusen bay, right by the waters edge, in the North Sea port of Wilhelmshaven.